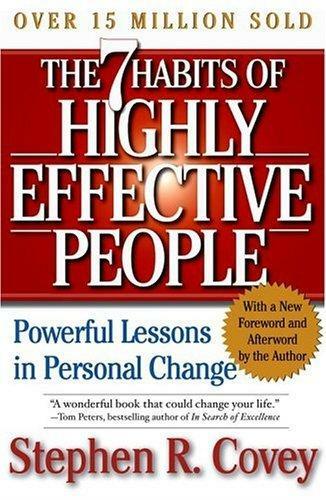 Covey developed a framework for personal effectiveness called; The 7 Habits of Highly Effective People. Over 15 million copies of his book on the subject have been sold worldwide. Be Proactive: Being proactive means that you take responsibility for your life and you don’t blame others for what ‘doesn’t’ happen. Proactive people are responsible, choose their behavior and are less affected by the environment around them. This is because, between the stimulus and response you have the power and freedom to choose the response. However, one of the most important choices you make every day is the ‘language’ you choose to use. Language is an indicator of how you perceive yourself. Proactive people use proactive language; I can, I will, I prefer etc. (reactive people say I can’t). Proactive people focus their energy on things they can control, and do something about those things. Reactive people, on the other hand, focus their energy on things they have little control over. Therefore, being aware of where you expend your energy is critical to being effectiveness. End In Mind: Covey says that your ‘ladder’ should be leaning on the right wall (every step you take leads you to the right place faster). However, to be effective at this you must learn to ‘imagine’ or envision what you desire. Writing a personal ‘mission statement’ will help you to concretely define the end goal. Once you have created that, all of your physical efforts should be directed towards that envisioned future. Therefore, according to Covey; first there is mental creation, which is then followed by physical action. He refers to this as ‘beginning with the end in mind’. First Things First: Trade-offs are an important component in achieving your goals. It’s all right to say ‘no’ when necessary, but remember that focusing on the highest priorities is essential. This third habit supports the physical creation of your goal (by combining Goal 1 and Goal 2). First Things First means that you identify your; purpose, values, roles and priorities. When you place 'First Things First', you are organizing and managing your time for your personal priorities. Win-Win: Covey says that life is a cooperative arena (not a zero-sum-game). Therefore, when you have a Win-Win mindset, you are constantly seeking out mutual benefit. You can cultivate a Win-Win mindset by practicing; integrity, maturity and an abundance mentality. When cultivating a Win-Win attitude, you balance courage with consideration. Understand 'To Be' Understood: You must learn to; listen, be more attentive, be more empathetic, be less evaluative, be less probing, interpret less and, better understand others. By doing this, you build up trust with others, and as a result you are more likely to be understood. Synergize: 1 + 1 = 3 only if you nurture an inclusive mindset. Synergy is a way to discover more, open up and gain new insights. Synergy grows because of the social, psychological, emotional and mental differences between people. Being All The Same = Being Just One. Therefore, being different is a strength, not a weakness. Sharpen The Saw: To be effective over time you must continuously renew four areas of your life (physical, social/emotional, mental and spiritual). By sharpening the saw, you can continue to benefit from the other six habits. Covey says that without renewal, we become weak. Therefore, taking time out to renew yourself is essential. Every day provides you with an opportunity for renewal, but that will not happen if there is a lack of desire, knowledge and skill. Unfortunately, most people are neither fulfilled nor excited with their lives. Therefore, practicing the Habits and periodically Sharpening the Saw, will help you find fulfillment and excitement in your life!